The Kettlebell Windmill is a highly effective kettlebell exercise that works deep into the shoulders, strengthens the core muscles and improves overall joint mobility. The windmill exercise with a kettlebell would be classed as a more advanced movement. 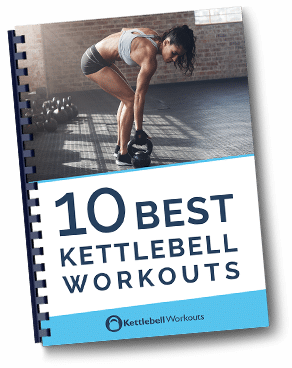 The Kettlebell Windmill exercise can be performed in a number of ways, loaded in the bottom hand, loaded in the top hand, and loaded in both hands. You can also keep the front leg straight or with a slight bend. The kettlebell windmill is a full body exercise that requires good joint mobility as well as joint stability. So the kettlebell windmill acts as an exercise to help strengthen the body from the inside out. Practicing the windmill exercise will help protect your body against injuries by conditioning the small stabilising muscles so the larger muscles have a stronger platform to work off. The kettlebell windmill should be not thought of a big strength building exercise like the overhead press but more of a mobilising and stabilising movement. Here are the basics of how the kettlebell windmill is performed with the kettlebell in the top hand. You will instantly notice during the movement that if you keep both legs straight that good flexibility is required through the hips and hamstrings. I highly recommend that you practice the windmill without a kettlebell before advancing to the loaded kettlebell windmill as mentioned above. As mentioned earlier the kettlebell windmill is a very demanding exercise on the shoulders and your hip and hamstring flexibility. Start by just practicing the movement without a kettlebell. Keep the legs straight and see whether you can touch the floor or opposite ankle. Take your time, this is a strong stretch that has gravity on its side. Can you manage 5 good repetitions on each side? The kettlebell windmill works deep into the shoulder stabilisers. As you descend through the movement the instability of the kettlebell overhead makes the shoulder stabilisers work very hard. Before you practice the full decent of the kettlebell windmill I recommend that you practice just holding the kettlebell overhead. Can you hold the kettlebell overhead with a straight arm for 60 seconds? 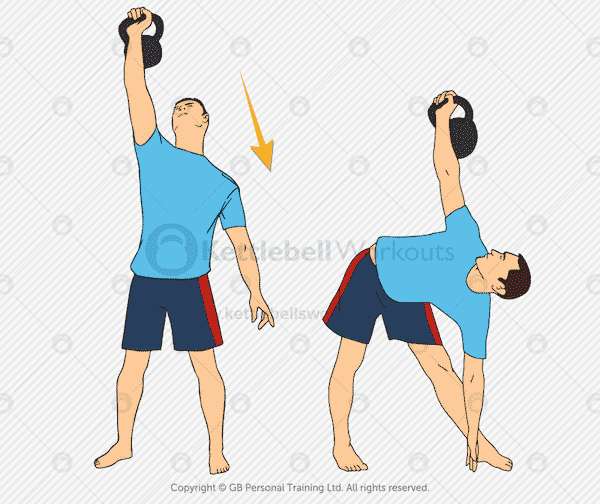 Next you should practice the kettlebell windmill with the kettlebell held in the bottom hand. Keep the other arm overhead as if holding a kettlebell. Decent slowly and with control. Can you reach the floor with the kettlebell keeping both legs straight? Finally we are on to the official kettlebell windmill with the kettlebell held in the top hand. Remember to descend slowly keeping the hips slightly rocked out to the side. Keep your eyes on the kettlebell all the way down and up. Can you touch the opposite ankle or floor keeping the legs straight? Once you have mastered the standard top handed kettlebell windmill then you can add a second kettlebell to the bottom hand. You should have already practiced the windmill with a kettlebell in the bottom hand and also one in the top hand so this is just a case of overloading the movement. The addition of an extra kettlebell increases the demands on the core muscles as well as the hamstrings. The kettlebell windmill whether performed with one or two kettlebells is a slow and controlled movement. For the inexperienced the top shoulder with get tired very quickly. You should keep the repetitions low. I always recommend starting out with your weakest arm and never performing more on your stronger side. The kettlebell windmill also makes an excellent warm up exercise before performing more demanding exercises. You need to be careful when warming up with the windmill that you don’t overdo it and leave your shoulder stabilisers weak for future exercises. Again keep the repetitions low, 5 each side should do it. The kettlebell windmill is a more advanced exercise that works deep into the core and shoulder muscles as well as improving hip mobility. 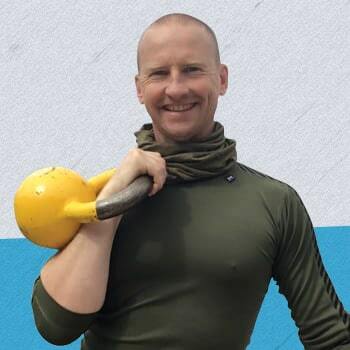 The kettlebell exercise should be progressed logically, first starting out with no kettlebell then adding one to the bottom hand and finally to the top hand. The more advanced variation loads both hands. Take your time throughout the exercise descending slowly and with control. Work on increasing the depth of the windmill while still maintaining perfect technique. Keep the repetitions low when using this exercises as a warm up or stand alone movement and be careful not to over fatigue the shoulder stabiliser muscles before a more demanding workout. Best of luck and enjoy the windmills. and now my back feels SORE. Must be because of wrong mechanics and/or weak muscles on the area. Yes you should not feel it in your back, practice the exercise without a kettlebell and also with the kettlebell in the bottom hand first. Only 5 reps each side. Best of luck.